Alex Dunlap is joined by Byron Lambert who is live at Seattle Seahawks training camp. 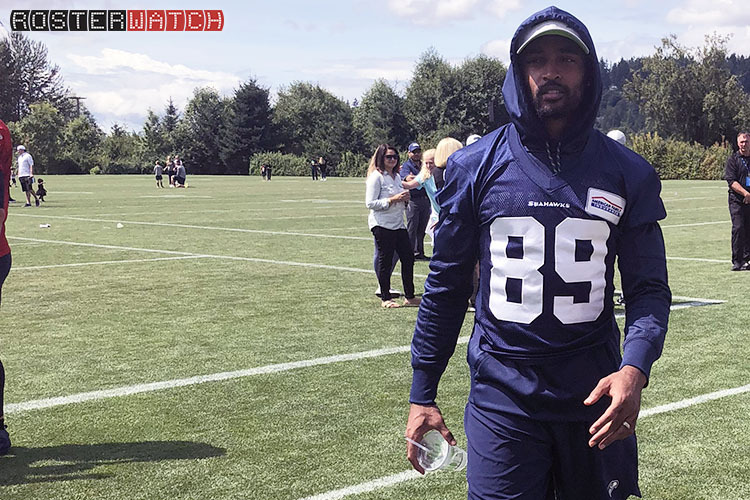 The two discuss Doug Baldwin’s nebulous injury, the running back committee brewing and more along with exclusive interviews from Tyler Lockett and Chris Carson. Byron-Which of the running backs in camp looked like the best in pass pro? And did Carson and Penny show good hands? Carson, and yes both showed solid hands. Carson made a monster play in the receiving game for a TD in the scrimmage. Thanks for all the great podcasts & Rosterwatch Pro Tools! Thank you so much for your loyal support. Means the world, and inspires us to keep plugging away for RosterWatch Nation! In a salary/dynasty/auction league with many keepers do I trade away Alvin Kamara at 2% of my salary cap for the first pick in the rookie draft and grab Barkley at 10% of my salary cap? I have no salary issues. More or less, who is worth more straight up? Tough call, you really can’t lose either way. I guess with some perspective, you’d have to say this is sell high on Kamara and Barkley is the best PPR asset we’ve seen come into the league in a while. I’d put my onions on the table and make the move for SB. Are these podcast gonna be on iTunes podcast app or just on the site? Only episode 1 is on there now..
Alex, Byron, and RW Nation!!! You guys are AWESOME! 2nd year PRO member here, brought home the CHIP last year with your help…VERY GRATEFUL! It’s a great core, so I’m leaning toward holding still and hoping Miller Time falls to me. Thoughts? I’d trade Fitzgerald and my RD3 pick in two shakes of a lambs tail to move MillerTime up a few hours……. Thanks so much, Byron…’preciate it man! Can anymore content be stuffed into 2hrs? The answer is no. Great show every time. Pop, sizzle and radio gold, you’re all so humble, when the POP is like a Supernova, the SIZZLE is like 1000tons of bacon getting hit by Napalm, and when radio gold is brighter than EL Dorado! Love the show, the podcast, the cheat sheets, but most of all the insane tools and content. Keep up the great work. p.s. If trash man doesn’t get a “This is Anthony Miller and you’re listening to Rosterwatch.” he’s dead to me, I mean i’ll start recycling. He came through! How disgusting! for 12 team PPR (1QB) what would be your ideal draft spot with 3rd round reversal? I’d go anywhere from 5-9 in order to get AB,SB,LF,AK,DH. Get on the sheet and start counting players in order to calculate your potential worst case scenarios and narrow it down from there.